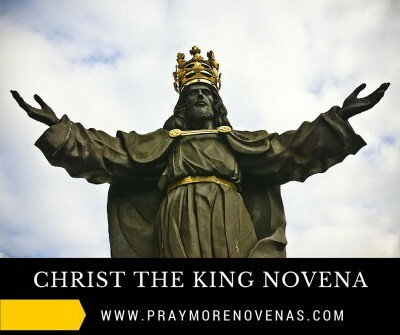 Here’s Day 9 of the Christ the King Novena! 1. Guide my families for love, unity, mutual understanding, peace, respect, protect from danger and always in good health. 2. Pray my Disability Tax Credit that for the 2nd time the Tax Revenue will give me a consideration and they will approve because in the first time I’m denied so please help me Lord, so that we will solve our financial struggles. 3. Please answer my prayers to victory of my case about my medical condition as well my husband case. I want my case to solve so that I’m free from stress and have a peace of mind. 4. Pray my husband to hire in the position in applying for fulltime in night shift at A. Always guide him on his new partime job as well my daughter job. Lord, help me. I am losing faith, it seems like by best is never enough. Please help me pass all my subjects so that i can finally graduate. I lay everything to you Lord. I would like to thank you for guiding and loving me. i hope that this is the time u will answer my prayers please St.jude help me in what i need now bcoz i really need job for my two children i hope everything will process us soon as possible…Thank you for everyday life and make me more stonger..
My sweet Lord, please hear my pleats. Heal my husband and may he become hungry for the Gospel… Also guide him to be an attentive husband and less worried about making money all the time. Give him faith to trust in you 100 %. Praying for our marriage. Amen ???? 1. Praying for a mind blowing change in my marriage. Please change it to the extent where I don’t even recognize this new amazing relationship. 3. Work in my husband’s heart so that he will think less about the pleasure he is experiencing and more about the pain he is causing us. 4.Restoration of parent/child relationship for my child and his father. 5. Miraculous healing for my child. 6. Bless and protect my father. 7. Turn arounds in all broken marriages, relationships and home. 8. God’s love and peace to reign in my life and marriage. 9. Please remove each and every person from our lives who have no respect for our marriage. Christ the King, I pray that you will reign in all our families, hearts, minds, bodies, & your will throughout the world. Loving God, I pray for the safety of my son’s as they travel the roads this Tuesday to come home for Thanksgiving. Hear my prayers, as I’m concerned about Liam’s car, it’s not in the best of running condition. This is out of my control, so for that, I pray as it is Your will to have my son’s arrive home safe. I pray that Christ the King reign in our lives, families and world, healing all divisions, doubts, fears and pain. I pray christ the king that you would bless my finances. I pray that my son would be successful with his exams. I pray that we allow His love to heal us and our relationships. Amen. I pray that Jesus reigns in the lives of my family. I pray that we open our hearts to His love, remembering that His love defeated sin and can ease our suffering. I pray that, by allowing His love to reign in our lives, we will have no room for fear, anger, resentment, or unforgiveness toward one another. I pray that we allow His love to heal us and our relationships. Amen.